Cash may be one of the most boring things to talk about when discussing a company and its investment prospects. Things like a company’s business model, its stock price, its future growth forecast, its yield, and its valuation are far more exciting. But cash is an asset that gives companies many options both in terms of pursuing growth opportunities and other forms of capital allocation like buying back shares, paying dividends and helping the business stay afloat during major downturns. A few of the gurus we follow on Validea look at cash as part of their assessment of the overall value of a business. In this article, I will take a look at how they use it. If you follow the economic news, you probably have heard that American businesses are flush with cash. The chart below from Bloomberg and the Federal Reserve shows the growth of nonfarm, nonfinancial liquid assets over the last 15+ years. 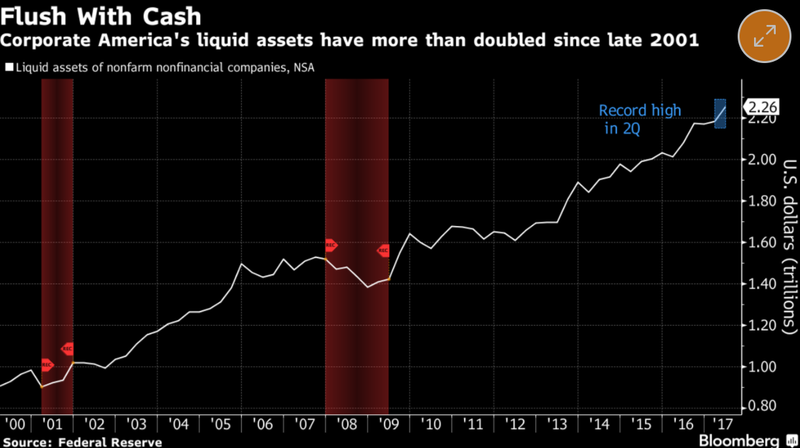 As the Bloomberg piece points out, liquid assets on corporate balance sheets, which includes a large portion in cash, has gone from less than $1 trillion in 2000 to more than $2.25 trillion through June 30th, 2017. There are a few major companies that are driving the corporate cash stockpile, including Apple and Berkshire Hathaway. Apple, which is currently the largest company on the planet in terms of its market capitalization, has over $260 billion in cash on its balance sheet. To put that in perspective, Apple could buy Nike, Lowes and CVS outright with the cash it has on-hand and still have billions leftover. But Apple, at least historically, doesn’t use cash as a way to make large major acquisitions. Instead, the firm has used cash to make small bolt-on acquisitions and as a hedge against the volatility of the technology business, where new products and the rapidly changing landscape can erode profits. The cash acts as a buffer, helping protect the firm in an ultra-competitive and changing business environment. Berkshire Hathaway, run by Warren Buffett, had approximately $100 billion in cash on hand up until recently. Buffett’s use of cash is largely there to make mid to large size acquisitions, buy publicly traded shares and swoop in for sweet-heart deals, all which have the potential to increase Berkshire’s earnings power over time. 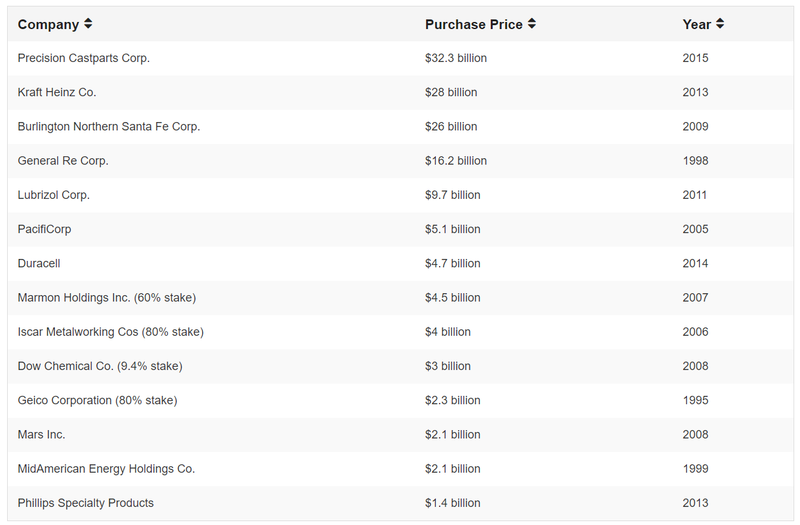 The chart below shows a number of Berkshire’s major investments through 2015. Buffett has said publicly that the minimum amount Berkshire will hold in cash is $20 billion. Buffett also likes being the lender of last resort, which allows him to get favorable terms on his investments. For instance, in 2011 Berkshire put up $5 billion for Bank of America to help strengthen its balance sheet. In return, Buffett got BoA preferred stock that yielded 6% and 700 million warrants that gave him the right to buy the bank’s stock in the future at the price at the time of the deal (i.e. $7.14 per share). Fast forward to earlier this year, and Bank of America’s stock was trading in the mid-20s, yielding a stake worth more than $17 billion when Buffett converted the warrants to actual stock, according to this CNBC piece. So if two of the most successful companies in modern day history are valuing high cash balances on their books, how might a fundamental investor go about identifying other companies that are similar in terms of their mindset with regard to cash? For that answer, we don’t have to look far, because on Validea there are a host of strategies that take cash into consideration when determining if a stock is fundamentally sound and provides compelling value. 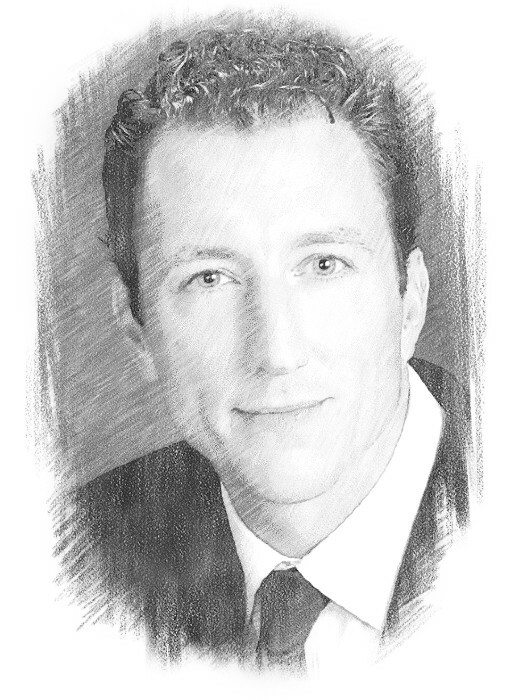 David Dreman – Contrarian Investor based on Contrarian Investment Strategies. View the Dreman-based model here. Current Ratio: the current ratio is the ratio of current assets divided by current liabilities. It’s an indicator of a company’s financial health. Since current assets include cash, a higher cash balance is a positive. The Dreman model favors firms that have a current ratio greater then the industry average or 2.0. Motley Fool – Small-Cap Growth Investor based on The Motley Fool Investment Guide. View the Motley Fool-based model here. Cash & Equivalents: The model likes to see positive cash balances, which give companies the ability to service debt or make acquisitions. Benjamin Graham – Value Investor based on The Intelligent Investor. View the Graham-based model here. LT Debt in Relation to Net Current Assets: This is a two factor metric. The first step is to determine Net Current Assets, which is simply Current Assets minus Current Liabilities. The higher the cash balance, the higher the Net Current Assets will be, all else being equal. Net Current Assets are then compared to Long-term Debt. For Graham, the calculation answers the question, “if this company were liquidated today, would it be able to pay off all its short and long term debt?” If the answer is Yes, that is a good sign. Peter Lynch – P/E/Growth Investor based on One Up on Wall Street. View the Lynch-based model here. Net Cash Per Share to Current Price: As a bonus criteria, Peter Lynch liked to see firms with a Net Cash Per Share that was equal to at least 30% of the current share price. Net Cash is defined as Cash & Marketable Securities minus LT Debt. If a firm had a Net Cash Per Share of say $3 and the price of the stock was $10, Lynch would find this attractive. Joseph Piotroski – Book/Market Investor based on Value Investing: The Use of Historical Financial Statement Information to Separate Winners from Losers. View the Piotroski-based model here. Change in Current Assets: The Piotroski model likes to see a current ratio in the most recent year of greater than the current ratio from the previous year. This demonstrates an improvement in liquidity and shows the company is in a better position to pay off its debts. When you start thinking of it this way, you can see how cash plays an important role for many companies in today’s market.